When seen from the bird's eye view of the Eira do Serrado, the Curral das Freiras (Valley of the Nuns) seems like an impossible place to settle – surrounded by steep mountains and accessible by vertiginous roads. But its hidden location is exactly the reason why it was discovered and embraced by generations of settlers, from the 15th-century slaves who escaped their masters to the 16th-century nuns who fled from pirates in Funchal. The Valley of the Nuns, as it is called today (Curral das Freiras translates loosely to Nuns' Refuge), is a step back in time for those who visit. Here one can find all things chestnut, which grows in abundance; terraced vineyards and cherry orchards on the lower slopes above the valley; and colorful houses that dot the landscape. Curral das Freiras (Valley of the Nuns) is reachable by the line 81 bus from Funchal along the ER107. From the north, there is a tunnel that cuts through the mountains, ver the vertiginous among us. Seeing Portugal’s Madeira region can be difficult on your own because of its hard-to-get-to highlights. This Jeep tour to Madeira’s cliffs and valleys charges through the area’s rough landscape, so you can stop by Boca dos Namorados, Jardim da Serra, Cabo Girão, and Câmara de Lobo all in one day. Plus, round-trip transport from Funchal is included for a seamless adventure. Experience a famous Madeira beauty spot on a small-group Nuns Valley (Curral da Freiras) trip from Funchal, Canico, and Machico. Traveling by air-conditioned minivan, make the scenic journey to Nuns Valley, a village tucked into an ancient crater-like bowl between vertiginous peaks. Stop at Pico dos Barcelos to gaze over Funchal, enjoy bird’s-eye views over Nuns Valley from Eira do Serrado, and visit the history-steeped village. Hotel pickup and drop-off, and choice of departure times included. Discover the vertiginous roads and secluded villages of the Valley of the Nuns (Curral das Freiras) on a 4x4 tour from Funchal. In an open-top 4x4, you’ll follow rugged routes and enjoy stunning views of Madeira’s mountainous terrain. Plus, you’ll stop to taste Portuguese liqueurs and pastries, and visit a wicker factory. Hotel pickup and drop-off are included. This is a fantastic choice for those who’d like to experience the natural beauty of Madeira. Take the stress out of organizing transport, by having round-trip transport included. 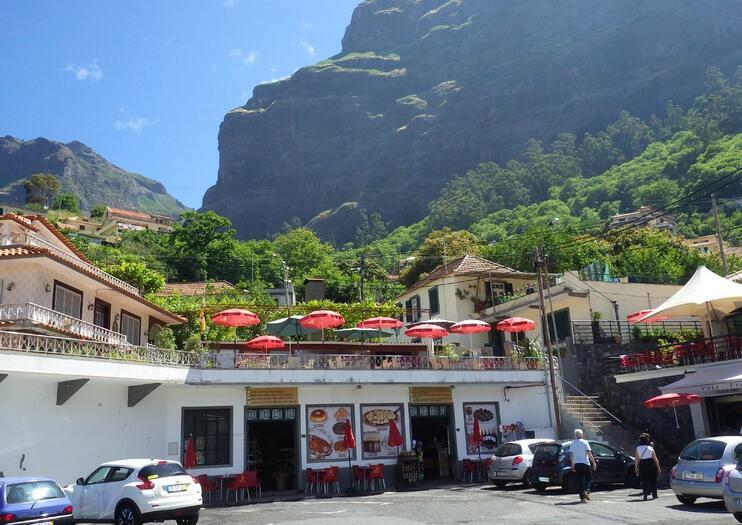 You’ll travel in an open roof 4WD, so you’ll get great views of the island, and stop off at lots of scenic viewpoints such as Nun’s Valley, and Pico do Arieiro. Drive past many of the island’s highlights such as Ribeiro Frio, and have a chance to stop off for refreshments at a Madeiran restaurant. This guided tour of Madeira is a great way to save time, and see multiple sites in one day. After a hotel pickup, you’ll travel by jeep to the heights of Nun’s Valley. Get access to beautiful panoramic views at Pico do Arieiro, which would be difficult to reach without a jeep. You’ll make the most of your trip by seeing Madeira from the water, and going on a dolphin and whale watching tour too. This is a experience 2 in 1, adventure at the mountains and ocean.Enjoy a half day tour to the "Nun's Valley" and Peaks at 1800 meters high in the morning, then, at the afternoon, enjoy stunning views of Madeira coast and island from out to sea on a "boat" Catamaran trip. Watch out for the whales and dolphins playing, jumping and splashing nearby the coast. Take a ride with me, Jeff "The Boss", as we go and explore this old village and its secret stories of pirates and criminals!​We´ll go down into the village and taste the local chestnut cakes and cookies and have a sip of the local "ginja" the cherry liquor.​There's hidden caves where people use to live hundreds of years ago, viewpoints from inside the valleyand even rock pools where the locals go swimming in the summer time(we can go swimming too if its warm enough) ​Nun´s Valley is so much more than the souvenir shops in the typical tourist spots!​Book now for an afternoon full of fun and surprises on a trip to Curral Das Freiras! It is a route mainly on the sidewalk with a great historical importance for the parish of Curral das Freiras, since it constituted for several centuries one of its main accesses. Only in 1959, with the arrival of the first road access to the center of the locality, this route loses importance. In Eira do Serrado, a visit to the belvedere, at a height of 1095 meters, offers a superb view over the village, the mountainous massif and the Ribeira dos Socorridos valley. It is a privileged place to have the perception of the erosive capacity of the natural elements that shaped the island.